UPrinting, the leading force in online printing, is the best choice for sticker printing. While we get how some people prefer maintaining their do-it-yourself attitudes, professional sticker printing has become so good that it beats printing your own stickers at home, hands down. It’s more convenient, very affordable and absolutely hassle-free. Need more convincing? Read on for the specifics. You can buy 500 professionally-printed stickers for just under $50 from UPrinting.com. That’s a cost of $0.10 per sticker. Meanwhile, your average label pack costs about $20 for 100 labels at a cost of $0.20 per sticker label (not including the cost of ink and your time!) and for what ends up being exceptionally low quality. When you order sticker printing through a professional online printer like UPrinting, you’re also getting the option to apply a high-gloss coating. That means your stickers will be more durable and last longer. Matte protective coating is also available. This is your brand, your identity; don’t let it get washed out thanks to at-home laser printer color capabilities. 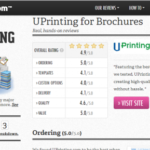 Instead, UPrinting’s sticker printing service does every run on a full-color, offset press. That means every sticker comes out bright, eye-popping and professional-looking. You have a business/life/family to run, do you really need to be spending your valuable time driving out to the Office Supply Hut, buying a generic label kit, wrestling with the layout on your computer and then fighting your printer to get each label printed? No. So, why not leave your custom stickers printing to the professionals? Simply upload your file, design your sticker on our U-Design site or purchase a professionally designed template for just $75 and we’ll ship your stickers right to your door in as little as 3 business days.